Does Your Estate Plan Contain An Unnecessary Bypass Trust? | The Levin Law Firm - Philip Levin, Esq. 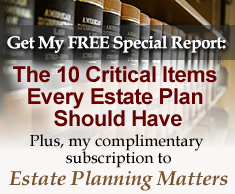 Does Your Estate Plan Contain An Unnecessary Bypass Trust? appealing option for many families. In fact, if you or your clients have an estate plan that includes one, you should reconsider its necessity, because it could be doing more harm than good. When the first spouse dies and leaves everything to the surviving spouse, the surviving spouse may have an estate that exceeds the federal estate tax exemption. A bypass trust, (also called a “Credit Shelter Trust”) was designed to prevent the estate of the surviving spouse from having to pay federal estate taxes.Years ago, it was prudent legal advice in estate tax planning to split an estate that was over the prevailing federal exemption amount between spouses and for each spouse to execute a Testamentary Trust to “shelter” the exemption amount of the first spouse to pass away into the Credit Shelter Trust. While the terms of such Trusts vary, they generally provided that the Trust income would be paid to the surviving spouse and the Trust principal would be available at the discretion of the Trustee if needed by the surviving spouse and possibly the children of their marriage. Since the surviving spouse would not control distributions of principal, the Trust assets would not be included in the surviving spouse’s taxable estate at his or her subsequent death, completely escaping federal estates taxes when ultimately passing to the family. However, in 2013, federal estate tax laws changed dramatically. Today, very few people are exposed to federal estate taxes. Currently, the first $5.45 million (in 2016) of an estate is exempt from federal estate taxes. As a result, theoretically, a husband and wife would have no federal estate tax if their combined estates are less than $10.90 million. Current federal estate tax laws now include “Portability Provisions”, which means that the exemption amount is also “portable” between spouses, accomplishing the same purpose as a Bypass Trust. Therefore, if the first spouse to die does not use all of his or her $5.45 million exemption, the estate of the surviving spouse may use the deceased spouse’s exemption amount, provided the surviving spouse makes an “election” on the first spouse’s federal estate tax return. One problem with a Bypass Trust is that the surviving spouse does not have complete control over of the assets in the Trust. The surviving spouse’s right to use assets in the Trust is limited and also requires the filing of accountings and separate tax returns each year for the Trust. In addition, if the Trust generates income that is not distributed each year to the beneficiary, that income can be taxed at a much higher tax rate than if it was not taxed at the income tax level for the Trust. Another significant problem today is that a Bypass Trust can actually cost the family much more in capital gains taxes than it saves in estate taxes. Under current law, when a person passes away, his or her assets receive a step-up in basis. However, when an asset is in a Bypass Trust, upon the death of the surviving spouse, all assets do not receive a step-up in basis because it is passing outside of the surviving spouse’s estate. As a result, when the inherited assets from a Bypass Trust are sold by the children after the surviving spouse dies, the family will usually have to pay capital gains taxes, at combined federal and state tax rates which can collectively exceed 15% of the inherited assets from the Bypass Trust. However, if the assets were not held in a Bypass Trust for the surviving spouse, and were inherited outright by the family, the children would have received a stepped-up basis on such assets, completely avoiding capital gains taxes. In specific circumstances, a Bypass Trust can still be useful for wealth transfer planning purposes. For example, if a client’s estate is greater than the current estate tax exemption, a Bypass Trust is still an excellent strategy to protect assets from the imposition of federal estate taxes. In addition, some states tax estates at thresholds much lower than the federal estate tax levels, and a Bypass Trust may also significantly reduce transfer taxes on the state level. For other people, these trusts have other uses besides avoiding estate taxes. To find out if your estate plan contains an unnecessary Bypass Trust, or if you need one to maximize the transfer of wealth to your family, please call The Levin Law Firm at (610) 977-2443 to arrange a complimentary consultation with attorney Philip Levin, Esq.